The Place With a Stage – Sunninghill School Dorchester. 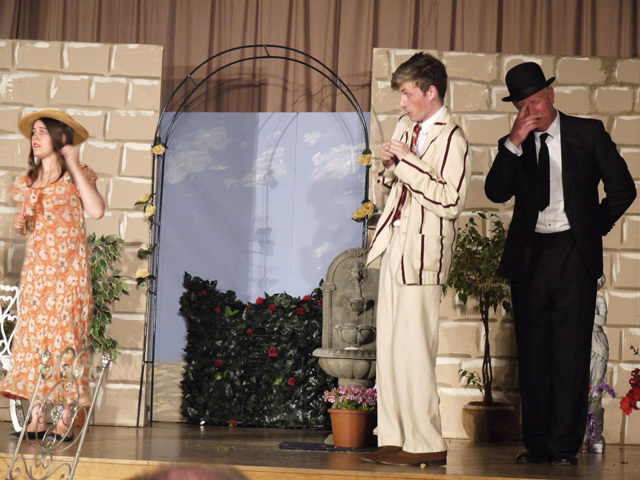 Dorchester Drama production of Jeeves in Bloom. Date: 20.07.2013 © Nick Heape. Jeeves in Bloom – Bournemouth Echo Review – Friday 19th July – Marian Cox – WHAT ho Jeeves – it’s that Bertie Wooster with his mad friends and family causing havoc as usual with their latest hair-brained schemes in a farcical comedy set in the 1930s. 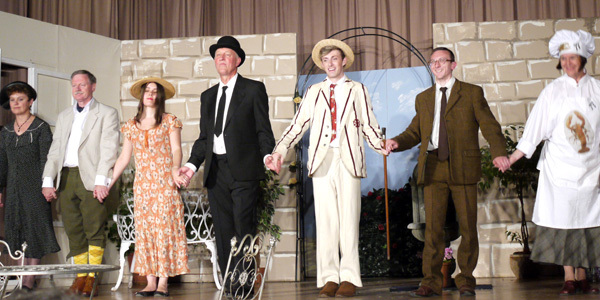 A number of PG Wodehouse’s best-loved stories have been condensed into a single production which, staged by Dorchester Drama, provides light-hearted fun and laughter for a perfect summer evening’s entertainment. Celebrating their 50th anniversary, the drama group bring to life Margaret Raether’s neatly constructed adaptation in a lively action packed farce that takes place at the stately home of the scary Aunt Dahlia. As usual the peerless Jeeves sorts out everyone’s problems ranging from the wooing of newt nerd Gussie Fink-Nottle, the financial woes of Aunt Dahlia and even the temperamental outbursts of the chef Anatole in a convoluted plot that goes at a cracking pace from start to finish. The Place With a Stage. Dorchester Drama production of Jeeves in Bloom. Date: 20.07.2013 © Nick Heape. Sam Kelly is well cast in the demanding role of the amiable idiot Wooster with the ever dignified Nick Heape as his butler Jeeves, the pair creating a double act that is a pleasure to watch. Capturing the essential flavour of the play, Stella Hollis is in brilliant form as the formidable Aunt Dahlia who puts everyone in their place, including her husband Tom, nicely portrayed by Paul Wallis who is transformed from a bad tempered bully into a doting darling, thanks to one of Jeeves’s magic medicinal potions. Jonny White and Emma Follis make an ideal couple as the hopeless romantics Gussie and Madeline as their courtship muddles along in the typical silly schoolboy style that Wodehouse made his own. The cast is completed by a suitably over-the-top Dee Thorne as the chef Anatole, a woman whose outbursts make Gordon Ramsey look like a mild-mannered pussycat. A particularly nice touch for this production is provided by a three piece musical group led by Alastair Simpson who add an elegant atmosphere to the evening with their welcome interludes playing popular tunes of the day. Director David Reeve has kept his eye on the ball of this quintessentially English comic romp and in doing so has produced an old-fashioned and civilised piece of theatre that is satisfying at almost every level.